Things are getting dark inside the Disney vault, the joy has left the Magical Kingdom, and all your favorite characters are wallowing in existential dread. At least, that’s the impression you would get looking at the official Disney Twitter account, which recently tweeted and then deleted a meme featuring a clip from Pinocchio and a less than cheery caption. “When someone compliments you but you’re dead inside,” reads the text that accompanies a GIF of Pinocchio’s lifeless puppet body being enchanted by the Blue Fairy. Of course, the GIF cuts off before Pinocchio is really brought to life because, you know, he’s depressed or whatever. His soulless husk is just as incapable of feeling self-love as we are in our increasingly dehumanizing modern existence. Classic Disney! Unsurprisingly, this out-of-character tweet got a lot of concerned responses from followers like “You OK there, Disney?” and “Who hurt you, Disney?” But, after doing a little bit of research, it’s easy to see this new self-loathing persona is just part of Disney’s most recent attempt to appeal to those pesky millennials. This particular meme, in addition to the quizzes and listicles that populate the Disney social media channels, are all associated with Oh My Disney, a Disney-centric Buzzfeed clone that functions as the company’s official blog. The stuff on Oh My Disney is still very tame but, because they’re appealing to slightly older audience, they aren’t afraid to peddle in relatable memes for 20-somethings. 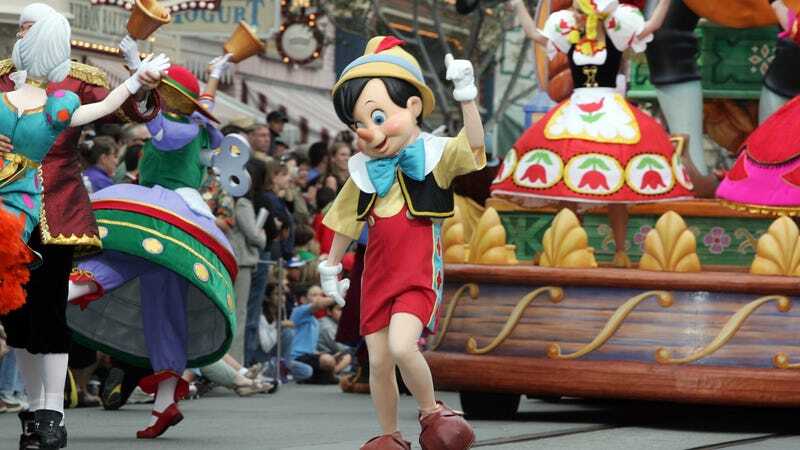 Still, it’s a little jarring to see Disney take the public stance that Pinocchio is depressed as hell or that there is anything less than an overabundance of joy in the world. And if this is an indication of the general mood in the Magical Kingdom, someone should seriously check on Eeyore.